I have to admit I had no idea what I was getting into when I made the decision to run 50 marathons, one in each of the 50 states. While marathon running has become very popular in the last few years there are still relatively few that do it on prosthetic limbs. I first needed to figure out how to to run 26.2 with a prosthetic blade. I suppose I am some what of a pioneer in this field. I’ve read all the articles and even a book or two about running marathons but honestly a lot of it didn’t really apply to me. I have had to learn a lot through trial and error. I have had to overcome things that are peculiar to just little ole me. Things like stump swelling (ouch), calcium deposits on my stump (yowee), hip tipping because one leg is longer than another. The tender skin on my stump rubbing raw (nasty pain). My good leg developing way stronger than my prosthetic leg throwing off my stride, etc. It wasn’t easy but I’m a very stubborn butthead and I refused to give up. I’ve been able to figure out a way to adapt, improvise and overcome all my injuries and stumbling blocks. This brings me to my second point. This is a BIG country by that I mean it’s a stinkin’ long way to travel across the whole thing from east to west. 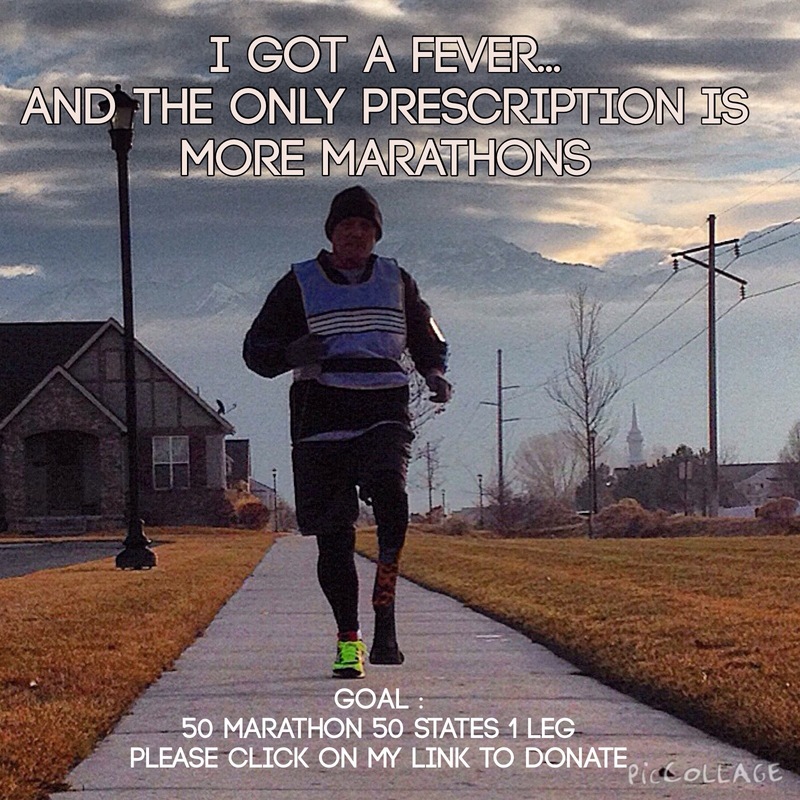 Before my insane goal of running a ‘marathon in every state’ I had only ever been to a handful of different states. My eyes have really been open as to how far apart everything is and how long it takes to travel to them. I have spent endless hours of exhausting driving with no sleep to arrive just in time to run 26.2 miles at a competitive pace. I am not complaining it has been the most wonderful adventure of my life. After running 41 marathons in 36 states to date, my experiences have made me much wiser and perhaps a little weirder. Now that I’m nearing the end of this wonderful goal I am having to travel further than I can drive so flying is my only option. Of course once I arrive at the different airports I need a car and a hotel. It all adds up very quickly. In my travels, I have met hundreds of wonderful people. They have touched my life and I have been a source of inspiration for many of them as welI. It has been my great privilege to give motivational speeches to various groups and places, adaptive sport programs, scout groups, businesses, women’s organizations, etc. My greatest desire is to continue to inspire and motivate people to overcome their individual challenges and see this goal to the end. Currently, I am struggling to pay for the remaining races. My billfold has run short. As a result, a fundraising campaign has been created to help keep this goal alive. Your donation big or small would allow this incredible goal to continue and spread the message that: Challenges can bring unexpected adventures. Please click DONATION box on the sidebar if you would like have a hand in helping me to inspire others with challenges. 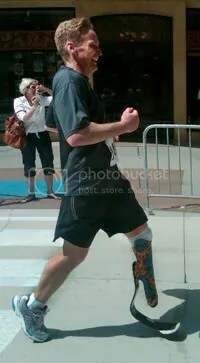 Posted in 50/50 Marathon Club, Adapative Athlete, Marathon Training, Marathons, Prosthetic LegTagged 50 marathons 50 states, adaptive athletes, amputee, blade runner, challenged runners, fundraiser, motivation, Tim HurstBookmark the permalink.